image courtesy of Fine Homebuilding magazineI first learned of a design approach that's come to be known as "new regional vernacular" when I was working for Mark Hutker on Martha's Vineyard some seventeen years ago. 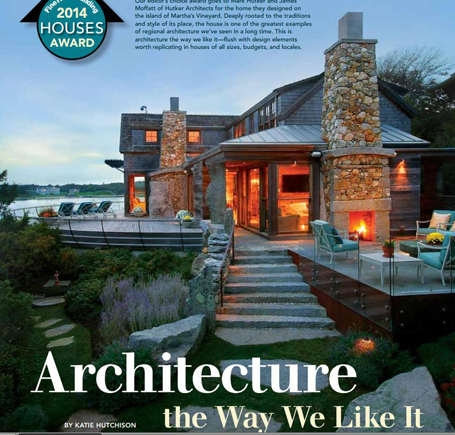 Then, this past January, I found myself back on Island touring one of Hutker Architects' stellar examples of new regional vernacular for a story Fine Homebuilding asked me to write for their HOUSES 2014 Awards Issue. The house, called The Nest, won their Editor's Choice award. The story brought me full circle: from my own introduction to new regional vernacular to an opportunity to introduce it to (and/or share it with) the readers of Fine Homebuilding and, now, you. To learn more about it, pick up the issue on newsstands now and/or peruse a PDF of the story from this link. Issue #243, Spring/Summer 2014. Reprinted with permission copyright 2014, The Taunton Press, Inc. 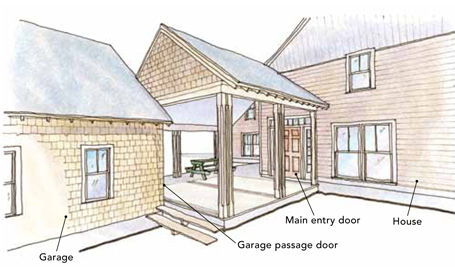 Image excerpt from my Fine Homebuilding "Drawing Board" column about breezeways. Offset breezeway example.Pick up a copy of the February/March 2014 Fine Homebuilding magazine to catch my latest "Drawing Board" contribution. This one explores designing breezeways that not only connect but serve as outdoor-living destinations. Click here for a PDF of the column. "Three ways for breezeways" by Katie Hutchison, Issue #241, February/March 2014. Reprinted with permission copyright 2014, The Taunton Press, Inc.
Visit the KHS publications page to see other magazine columns and articles I've written.